Figure 13-8. - Splint for a fractured femur. Remember that any injured part is likely to swell, and splints or bandages that are all right when applied may later be too tight. FRACTURES. - A break in a bone is called a fracture. There are two main types of fractures. A closed fracture is internal where the bone is broken but there is no break in the skin. With an open fracture, there is an open wound in the tissues and the skin where the bone has broken through. This type of break and wound is also referred to as a compound fracture. Figure 13-9 shows closed and open fractures. 1. If there is any possibility that a fracture has been sustained, treat the injury as a fracture. 2. Get medical aid at the first possible opportunity. All fractures require medical treatment. 3. Do not move the casualty until the injured part has been splinted. Figure 13-9. 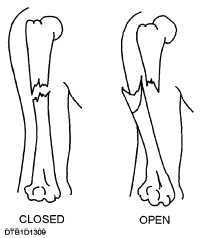 - Closed and open fractures. 5. Do not attempt to locate a fracture by grating the ends of the bone together. 6. Do not attempt to set a broken bone. 7. When a long bone in the arm or leg is fractured, the limb should be carefully straightened so splints can be applied. Never attempt to straighten the limb by applying force or traction. Pulling gently with your hands in the direction of the long axis of the limb is permissible, and may be all that is necessary to get the limb back into position. 8. Apply splints. If the casualty is to be transported only a short distance, or if the patient will be seen very soon by a medical officer, it is probably better to leave the clothing on and place emergency splinting over it. 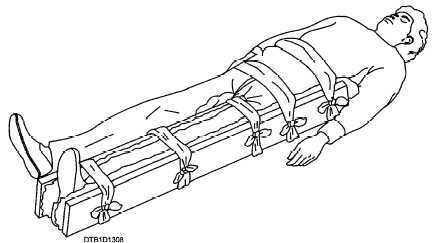 If the casualty must be transported for some distance, or if a considerable period of time will elapse before the patient can be treated by a medical officer, it may be better to remove enough clothing so that you can apply well-padded splints directly to the injured part. 9. If the fracture is open, you must take care of the wound before you can treat the fracture. SPRAINS. - A sprain is an injury to the ligaments that support a joint. A sprain usually involves a momentary dislocation, with a bone slipping back into place on its own accord.